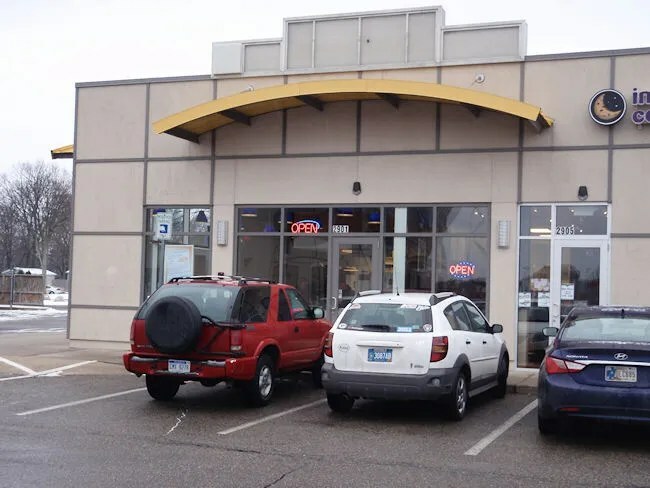 I know I’ve been slacking quite a bit on the Kalamazoo area reviews, but you know when a burger joint opens, I’m going to be check out as soon as possible. 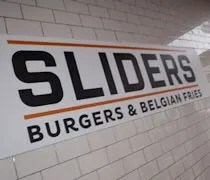 That was the case this weekend when Sliders Burgers and Belgian Fries opened up in the Campus Pointe Mall on the corner of Howard Street and Michigan Avenue near the Western Michigan University campus. This new burger joint moves into the space that was previously occupied by a burger joint. The corner space in this section of the mall used to house The Real Deal: Classic Burgers & Fries. I really liked that place, but it didn’t seem to last too long. 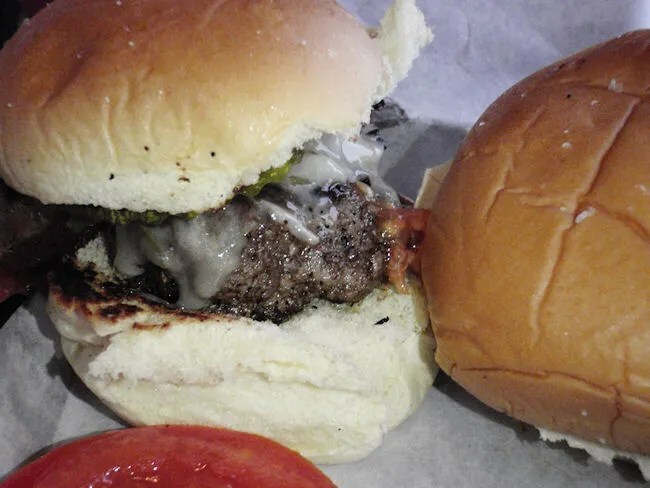 There was a little bit of confusion over when Sliders would actually open. It came out on Friday on Twitter that they would be opening on Saturday, but an article in the Kalamazoo Gazette tried to squash that saying they wouldn’t open until Monday. Twitter was right. They opened on Saturday. I don’t usually see J get excited over burgers, but when I mentioned they were opening this weekend, she made it a point to make sure I knew she wanted to go. You really don’t have to argue with me to get burgers. It’s been a while and I really was looking forward to one. We walked in to the restaurant a little after 1:00. There was a large table of recently returned from winter break students waiting for their food and a group ahead of us that put in a pretty large carry out order. I grabbed a paper menu off the counter while J started looking over one that was taped to the counter. Since I had been studying the menu online, I pretty much already knew what I wanted. My order was the Classic Burger, which I made a double, and added on Cheddar Cheese and Bacon. The extra patty cost an additional two bucks and the bacon and cheese were each an extra fifty cents. To round out my meal, I added a large Belgian fry and a large Coke. J went with the #1 Combo Meal that came with Two Sliders, a small Belgian Fry and a small drink. She upgraded both the fry and drink to a large and added pickles, lettuce, and bacon to her sandwiches. We ordered L a grilled cheese. After paying the $27 tab, we started to head for a table. J asked if they had a high chair or a booster seat. The answer was no, so I just put L on my lap which is fine as long as she has food in her hand. We knew Sliders wasn’t fast food, but it took an awfully long time to get our food. I’m going to chalk that up to, the restaurant has only been open for a day…but with a hungry baby, fifteen minutes can seem like an eternity. While we were waiting, we took turns walking with L around the small dining room decorated with subway tile walls. On one of her trips around the dining room, J noticed the Sauce Bar back near the cash register and went back to get herself a couple sauces for fry dipping. She was super excited to try the Classic Fry Sauce. She spent two years living in Idaho Falls and fry sauce is a staple in that part of the country. She also got the Spicy BBQ. When our order was ready, the cashier brought out two plastic trays loaded with food. Right away, we both knew we over ordered. The Classic Burger with two patties is huge. The patties are fresh ground beef grilled to order. 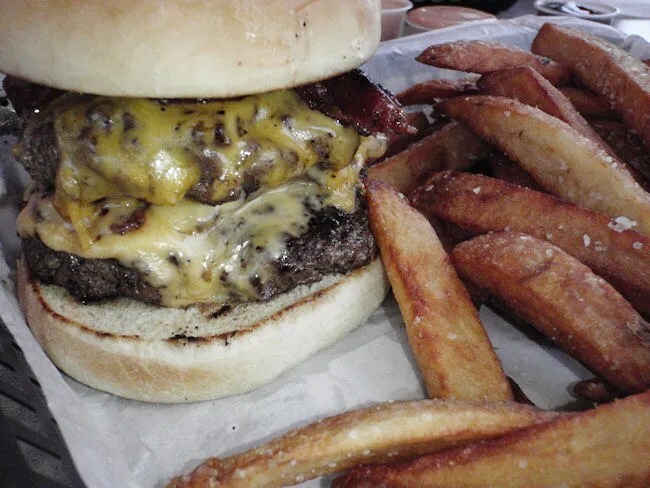 My two juicy patties were then topped with a small pile of crispy bacon and deliciously melted cheddar cheese. The meat is served on a soft, flaky bun that has the appearance of a typical white bread hamburger bun, but comes much softer than the almost stale bread you normally get at burger joints. The Belgian fries are thick cut with a crispy, golden brown exterior and a light, fluffy, potato-y interior. J asked if I liked them because I normally don’t like what are usually called “Steak Fries”, but these were actually very good. There was a light dusting of coarse salt that gave these fries, along with the crunchy exterior, a very unique flare. J’s two sliders were not quite what I was expecting. Each sandwich was a two ounce burger that was topped with the pickles, cheese, and bacon she ordered…she also ordered lettuce, but got tomatoes instead. She just pulled those off and ate the sandwiches as they were. Whenever I heard the term “slider” I automatically assume there are going to be onions involved, but, by default, there are no onions. There are three onion choices for your to choose from (white onions, caramelized onions, or red onions), but the burgers don’t come with the onions already on them or cooked in to the them. When I first met her, J didn’t eat hamburger and slowly overtime, she’s come around to the dark side. For a long time, she would only eat very thin, frozen patties. When she got pregnant with L, she started craving fast food burgers. Sliders burgers are neither. These are much thicker, juicy, fresh meat burgers and J really liked her two sliders. 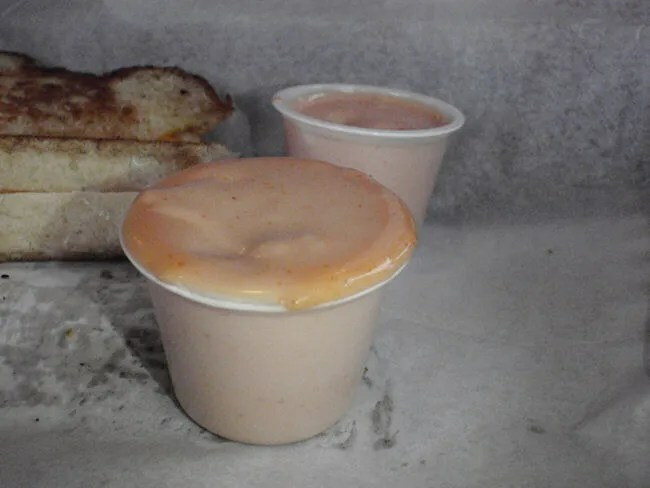 As for the Fry Sauce she was so looking forward to, turned out she was a little disappointed. She said it had more of a tartar sauce taste to it whearas she’s used to more of a Thousand Island. She loved the Spicy BBQ sauce though and went back for more. L’s grilled cheese was a pretty standard grilled cheese. 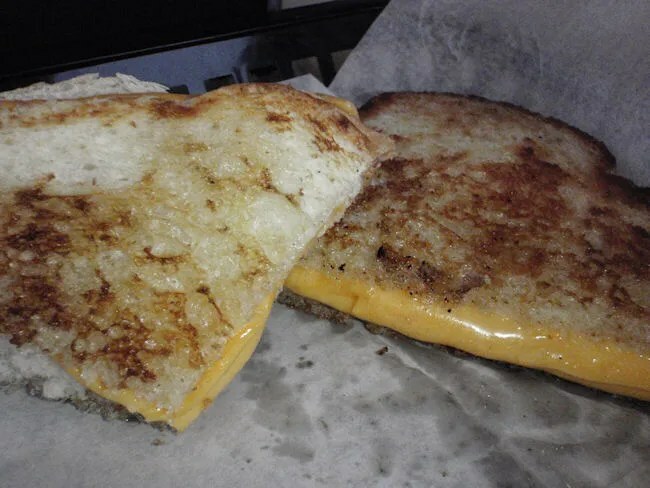 Two slices of sourdough bread and cheese. Once L gets a hold of grilled cheese, she won’t let go until it’s gone. J and I were done with our meals and she was still working on the first half of hers. We ended up letting her keep it in her hands as we put her in to her car seat. I finally had to pry it out when we got to Meijer to grocery shop. She was still working on it and didn’t want to give it up. From a purely taste stand point, Sliders was a hit with both of us. I know we stopped in on Day #2, which contributed to a few of the service issues. The great thing about Sliders is that they’re open late and they deliver until 3 AM. Since I get off of work at midnight most nights and still have an hour drive back from Grand Rapids, my only choice for food is usually McDonalds. I love that I have another choice and one that is so tasty. Glad you enjoyed the sliders, burgers and Belgian fries! We are sorry to hear about your service issues and thank you for bringing it to our attention. We will be adding high chairs, and hope to see you all again soon! The manager at this place is atrocious. I’ve heard a number of reports that she’s fired people for little to no reason other then she doesn’t like them, as well as been drunk on the job. This place doesn’t even hold a candle to Real Deal, and they will be gone in half the time. This place has two advantages over Real Deal….it’s much cheaper…and it’s open well in to the night…after the bars close. Food wise, I’d probably agree with you, but Real Deal was way too expensive for the drunk college crowd. My delivery experience has been mostly good. The burgers are great, but the fries are often undercooked. Delivery time has always been speedy!